One day, he’s tracked down by a man he’s never met - a man his mother claimed was dangerous. The man tells him an impossible secret: Magnus is the son of a Norse god. I knew this book was going to be good as soon as I opened it and saw the chapter titles. Rick Riordan is one of my favourite authors. I loved the Percy Jackson series, so I was really excited for Magnus Chase. And for once, my expectations were surpassed. 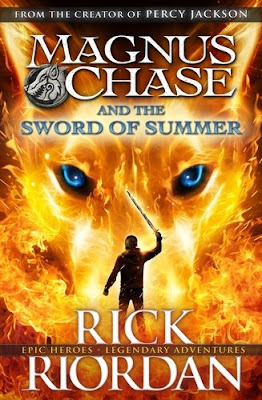 I didn't think this would beat Percy Jackson, but in my opinion Magnus Chase is possibly Rick Riordan's best book yet. Magnus Chase is funny. I mean, it's really funny. The humour is spot on, with Magnus' sarcasm and the overall humour of the book. You expect humour from Rick Riordan, but this takes it to a whole new level of hilarity right from the start. The characters are great too. The Sword of Summer is crammed full of interesting and varied characters. From the hero, Magnus, to disgraced Valkyrie Sam, to Magnus' homeless buddies Hearth and Blitz. Plus, not forgetting the gigantic cast list of various Viking extras, and the gods. Just like the Percy Jackson series, Riordan modernises and humanises the gods. They maintain their key attributes (e.g. Loki is still the deceiving trickster) but Riordan manages to debunk the Marvel myths and return to the original Nordic roots, while still adding his own fictional twist to the characters. Thus Thor becomes a TV addict, Ran becomes a hoarding bag lady, and Odin makes speeches using PowerPoint. It's a perfect example of how skilled a writer Riordan is. There are a heck of a lot of characters in this book, but he manages to write in a way that avoids confusion and allows you to figure out who everyone is with ease. At just over 500 pages it's a fairly long book, but I didn't mind that. It allows you to become fully immersed in the story, and gives room for fun little details and detours that a more concise version would have cut. And when it's such a good story, as far as I'm concerned, the longer the better! The pace was great, it wasn't rushed and didn't drag. The storyline picked up in all the right places, interspersing moments of action and drama with quieter time for reflection and character development. However, one thing that did surprise me was the complete lack of romance. Literally, there wasn't a single bit. In any other YA book Magnus would have ended up with Sam, but here Sam's in love with another guy. Romance just didn't feature at all, which was a bold move by Riordan considering the fact that it's almost a given in YA nowadays. The Sword of Summer is easily a five star book, and one of the best books I've read this year. If you need me, I'll be here waiting for the sequel to come out! Magnus Chase and The Sword of Summer is available to buy now. Are you a fan of Rick Riordan? Will you be reading The Sword of Summer? Let me know in the comments below! Everyone knows that David Baldacci is a big name in literature. So you might be surprised to know that The Keeper was the first book of his that I've read. Because Baldacci is such a big name I had quite high expectations. I mean, he has to be that popular for a reason, right? As I'm sure you know by now, YA is the genre I like the most and I'm the most knowledgeable about. Plus it's fantasy, which is a genre I also like on the whole. And who doesn't love delving into a new writer's catalogue for the first time? When I started this book I have to admit that I just jumped into it headfirst without really researching it. Consequently it came as a bit of a surprise when I found out that it's actually the second in a series, The Vega Jane series, sequel to 2014's The Finisher. Luckily this wasn't a problem as it was easy to pick up on the main plot and key points of what had happened in the previous book. I imagine it would be a bit repetitive for those who have read the first book, but it enabled me to quickly get a hold on the story. But despite that, if I'm completely honest, I didn't really enjoy this book. It felt unoriginal and lacked that crucial spark. Instead, it was full of recycled cliches from the fantasy genre. It was fast-paced, but far too rushed towards the end. And the whole idea of the five different circles of the Quag reminded me of the Quarter Quell arena in the second Hunger Games book, Catching Fire, though that's probably just coincidence. Another thing that bugged me was the way that everything that could possibly go wrong did, then it all got happily resolved in a completely unrealistic way. 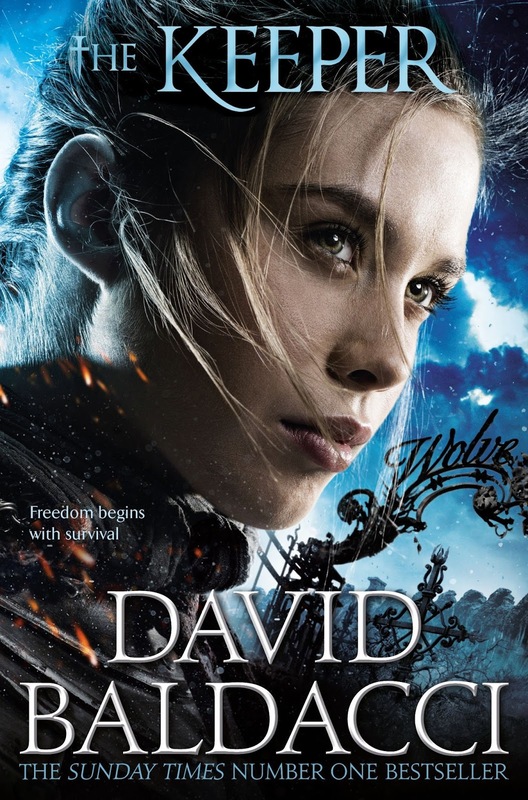 The book was full of action and drama, but I just couldn't take any of it seriously because whenever the author wanted the plot to move on the problems would just get instantly, conveniently resolved within a page and we'd be zooming off to deal with the next thing. The basic idea is what pulled me into this story, and it's probably one of the only reasons why I trudged on to the very end. I pretty much knew what was going to happen from the beginning, but something in that sparked my interest just enough to keep me reading. The characters were the other redeeming feature. 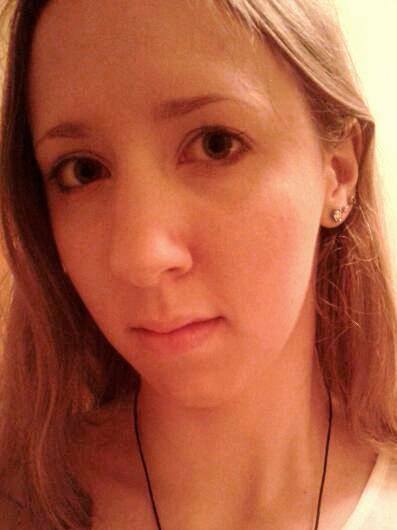 They were all different, intriguing people, with enough of a backstory to make me interested in them as individuals. In particular, Vega Jane's journey of self-discovery through her past, leading to finding out about her magic, was great. I found Delph to be a surprisingly complex character, and of course, who wouldn't have a soft spot for Harry Two? But at the end of the day, I honestly expected better from an established writer like Baldacci. The Keeper wasn't terrible, but I wouldn't recommend it either. However, if you're still interested, The Keeper is available to buy now. Are you a fan of David Baldacci? Will you be reading The Keeper? Let me know in the comments below! I should firstly point out that Scott Westerfeld is one of my favourite YA authors. I hadn't previously heard of his co-authors, Margo Lanagan and Deborah Biancotti, but I was nonetheless excited for this book. However, my expectations fell a little flat. I'm a fast reader, but it took me weeks to get through this book. Once I started reading I was alright, but convincing myself to pick it up to get reading in the first place proved to be somewhat of a struggle. No matter how hard I tried, I just couldn't get into the story. And that's a shame, because it wasn't a bad book. It had action, crime, romance and lots of superheroes - which sounds like the perfect formula for a book. But something stopped me from being able to fully engage with the story. There were quite a few characters and I felt a bit lost with them all. When the book starts you get thrown straight into the story with no explanations or backstory. Now there's nothing wrong with that, in fact it's a great way to get readers interested and hooked on the story, but I prefer to have a bit of grounding first so I can figure out what's going on. It almost felt like a sequel, as if the authors were carrying on a private conversation and the readers have been left in the dark. It's an intriguing concept. I love superhero stories (hence my love for the Marvel movie franchise) and this is a great use of that. All the Zeroes have different personalities lending them varying characteristics which gives them a range of interesting superpowers. One of the things I found the most interesting was Ethan's power, because his is the only power of the group to work better one-on-one - the only person who's power goes against the Curve. But the most interesting character of them all was Thibault. Codenamed Anon because his power makes him become invisible in crowds, I found his story more interesting than the actual main plot. I wanted to know more about Anon, his backstory, and his growing relationship with Flicker. I also thought he was the best narrator - he's smart and he has a dry sense of humour and a unique way of looking at things, which I enjoyed reading. For these reasons I can't say that I didn't like Zeroes. For all intents and purposes I did like it, because it was a good story with some great characters. It just lacked that personal hook that you need to really get into a story, but overall it really wasn't bad. Zeroes is available to buy now. 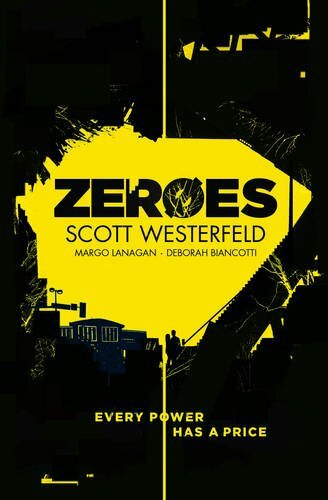 Will you be reading Zeroes? Let me know in the comments below! * First published on Kettle Mag here. Over the past year, Rae Morris has been slowly but surely making a name for herself in the music industry. The 23 year old songstress released her debut album, Unguarded, back in January of this year. The album peaked at number 9 in the UK chart, and brought Rae to the public’s attention. Unguarded was very strong for a debut album. It features 12 tracks of Rae’s distinctive piano-led pop, some including a twist of folk, others much more pop-oriented. You can find my original review of Unguarded here. And now Rae is off on her own headline tour, riding on the success of Unguarded.In her own words, she’s only ever dreamed of a tour as big as this, so to make it become reality is a massive accomplishment for her. And it really shows – it’s clear to see how much it means to Rae, which makes the tour only more special. Cambridge Junction is a fairly intimate music venue, allowing fans to get up close and personal with artists. It’s the perfect contrast to the glut of massive arena tours dominating the music industry at the moment. It also showcases talent like Rae’s perfectly. Support came in the form of Dan Owen, followed by Roo Panes. Singer-songwriter Dan Owens got the night off to a brilliant start. His last song was especially memorable as he transformed into a one-man band, playing the guitar, bass drum and harmonica as well as singing all at once. The second support act, Roo Panes, kept on building the atmosphere. Singer/guitarist Roo Panes was joined by a cellist, forming an intriguing duo to play songs from their classic folk-pop repertoire. By the time Rae Morris came on, the crowd were more than ready to see the main act of the night. 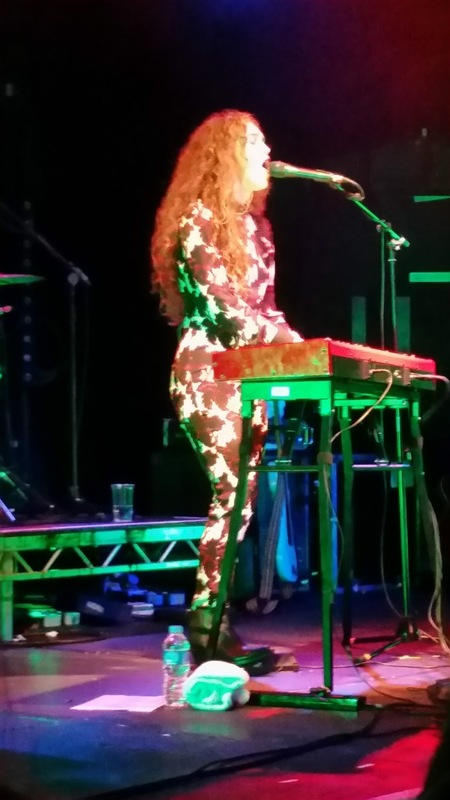 Rae came on stage to plenty of applause, launching straight into her track ‘Skin’. Clad in a bold, patterned jumpsuit and with her trademark curls set free, she was every inch the picture of a folk-pop songstress at the top of her game. The show continued with hit after hit from Unguarded, plus a rendition of ‘Up Again’, the track she wrote for electronic group Clean Bandit. The more upbeat numbers seemed to be the biggest hits with the audience, with songs like ‘Under The Shadows’ getting people moving and dancing along to the music. However, a personal highlight of mine was Rae’s moving performance of the emotional track ‘Don’t Go’, which has recently been re-released for the breast cancer charity ‘CoppaFeel!’. My only criticism is that the set was quite short, especially when compared to the extensive sets of some other artists. Perhaps this was due to the high level of organisation – everything started and finished on time, and there was no messing about on the production front. To be honest it was a nice change to attend a gig where everything did run smoothly for once! It could also be down to the fact that Rae (as she admits herself) isn’t much of a talker between songs. Either way, it was still an enjoyable show and a great evening. 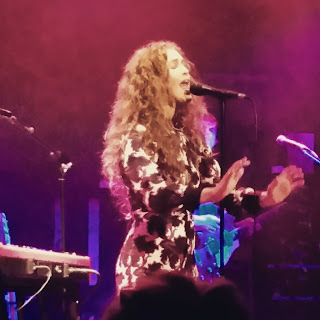 Are you a fan of Rae Morris? Let me know in the comments below! 2015 has really been James Bay’s year. At the start of the year virtually no-one had heard of him. Now, nine months later, everything has changed for the 25-year-old from Hitchin, Hertfordshire. Over the course of one short year Bay has had a number one album, Chaos and the Calm, received the Critics’ Choice Award at the 2015 Brit Awards, and it has just been announced that Chaos and the Calm has become the biggest album of 2015. Riding on the success of Chaos and the Calm, his debut studio album, which I also reviewed for Kettle earlier in the year, James Bay is out on tour again. Last week saw him complete a sold-out three-night residency at Brixton’s O2 Academy, before continuing on his world tour, which culminates with another three-night London residency at the Eventim Apollo in March 2016. Now, for someone who’s currently at the top of the UK music industry, I surely wouldn’t be wrong for expecting a polished, slick performance from a James Bay show. It started off well on Wednesday night, but I was left with the distinct feeling that things weren’t quite going as planned on the technical side. In between every act crew members were scurrying around the stage, trailing wires, fiddling and testing equipment and instruments. Don’t get me wrong, I’ve been to enough gigs to expect a bit of this. But surely that’s what a soundcheck is for - making sure all the problems are ironed out so everything runs smoothly on the night? Support came in the form of singer-songwriter Samm Henshaw, followed by the slightly eccentric Elle King. I’ll be honest, by the time I got into the venue I only caught the last song of Samm Henshaw’s set. But Elle King, for all her issues, was a fitting support act for James Bay. Her songs can best be described as a kind of country/pop hybrid, complete with banjo playing and a big dose of shameless American honesty. So after that, the crowd were well warmed up and ready for James Bay. He was due on stage at 9 o’clock, but it was almost half past by the time he finally came on. By this time the crowd were restless, people kept checking their phones and fidgeting, especially those limited to a tight schedule by trains needing to be caught. Despite this though, the actual show was great. From the moment he came on stage, silhouetted against the curtain with his guitar and trademark hat, it was worth the wait. The setlist interspersed all the best-loved songs from Chaos and the Calm with new songs and songs not on the album. He also performed several covers, which was kind of a given when you only have one album’s worth of material to pull from. James was still recovering from a cold on Wednesday, which had sparked thankfully-unnecessary fears about the potential cancellation of the show. But from the energy he showed and the way he was leaping about the stage, you wouldn’t have guessed it. The entire show was performed with high-energy that got the crowd going. Down in the stalls everyone was dancing and singing along, and up in the circle we all defied the ‘no standing’ rule to get up and show our appreciation. When the encore arrived, James had one more trick up his sleeve. He announced he’d be playing one of his favourite songs, a Faces cover, then proceeded to bring out no other than the legendary guitarist Ronnie Wood to play it with him. Needless to say, this made the crowd go wild, and was the perfect way to top off the night. If you can, I really recommend going along to see James Bay live. As good as he sounds on the album, he’s even better live. I get the feeling 2015 is only the beginning for the man in the hat. You can see James' upcoming tour dates and buy tickets here. Are you a fan of James Bay? Let me know in the comments below!